After years of refusing to make the move to MP3, the Beatles may give Steve Jobs' iTunes an exclusive, reports Fortune's Tim Arango. 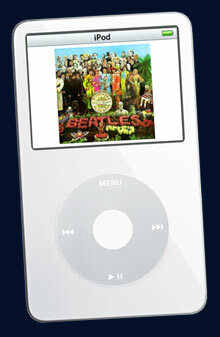 NEW YORK (Fortune) -- Click on the iTunes music store and punch in "Beatles" under artist search. More than 50 albums will pop up, including Arthur Fiedler and the Boston Pops Play the Beatles, but none are the real deal. Fans wishing to download the actual Fab Four in MP3 format have to search peer-to-peer sites like Limewire for unlicensed songs they can listen to free. But that may be about to change. While details remain to be worked out, Fortune has learned that iTunes is close to a deal to bring the Beatles catalog online. Apple Computer (Charts) is said to be angling to become the exclusive online music store for the Beatles for a limited window of time. Other music stores, such as Microsoft's (Charts) MSN and Rhapsody, have courted the Beatles over the years to no avail, but it appears Apple is close to getting first dibs on the band's hits. When reached by Fortune, an Apple spokesman responded that the company does not comment on "rumor and speculation." If the deal goes through, it will mark a Nixon-Brezhnev-worthy truce - with the band's record label, Britain's EMI Group, serving as a peacemaker - between Apple Computer's Steve Jobs and Neil Aspinall, the onetime Beatles road manager who is now guardian of the band's business interests under the rubric Apple Corps. At a recent industry conference, David Munns, head of EMI North America, said the Beatles would be available online "soon." The parties were hoping to make a splashy announcement to coincide with the Nov. 21 release by EMI's Capitol Records of "Love," a mashup of Beatles songs that serves as a soundtrack to a Las Vegas Cirque du Soleil production. That didn't happen. Apple Corps declined to comment. As Fortune went to press, numerous deal points were still being hammered out. According to a music industry executive apprised of the talks, the parties were discussing how lengthy a window of exclusivity iTunes might get and how many tens of millions of dollars Jobs - who is said to be personally involved in the discussions - will commit to an advance for the band and marketing costs. Also being discussed is whether the band would be willing to take two steps at the same time and endorse the iPod by allowing its music to be used in a commercial. Another scenario making the rounds is the prospect of the Beatles following U2's example with a branded iPod. "If the Beatles were in an iPod ad, that would be humongous," this executive said. The deal could well fall apart for any number of reasons, including the long-running legal feud between Apple Corps and Apple Computer over both their names and the similarities between the Granny Smith that appears on the label's LPs and the half-eaten apple that is Jobs' corporate logo. Apple Corps has been in and out of courtrooms with Jobs' Apple for more than 20 years. In the latest incarnation last May, a London judge ruled in favor of Jobs - saying that the iTunes service did not violate a 1991 deal in which Jobs was allowed to keep doing business under the Apple name as long as he agreed not to enter the music business. The Beatles have lodged an appeal, which is slated to be heard next February (clearly, if the two Apples wind up in business together, the matter is likely to be dropped). "The Beatles' position is that they don't sing jingles to peddle sneakers, beer, pantyhose, or anything else," a lawyer for the band told the Associated Press at the time. Notice he didn't say iPods. Fortune's Peter Lewis gives the new Microsoft Zune the iPod challenge.